It was 45 years ago, on April 14, 1970 those three astronauts, namely: Jim Lovell, Jack Swigert and Fred Haise were on their way to the Moon, as members of the Apollo 13 mission. At more than 300,000 km from Earth, one of their two oxygen tanks exploded, leaving them with no choice but to abort their mission and find their way back home through an epic journey of survival, a story of ingenuity and team work. The total absence of light that can be experienced merely in space was almost certainly the source of inspiration for Omega when they’ve designed the Speedmaster Dark Side of the Moon. I still remember hearing Chris Hadfield giving an interview to CBC after his return from his space mission and one thing that he described that truly moved my imagination was the blackness of space, a black we can’t knowledge here on Earth. This week at Baselworld, four new Omega speedmaster is released, including Black Black, Sedna Black, Pitch Black and Vintage Black. All these belong to the popular Speedmaster Moonwatch Dark Side of the Moon collection. The Sedna Black (Ref. 311.63.44.51.06.001) is the consequence of the combination of Omega’s ceramic technology and their popular rose gold alloy, called Sedna gold. With the omega Black (Ref. 311.92.44.51.01.005), Omega has turned off the lights entirely, opting for a refined and brushed black ceramic case, a matt black ceramic dial and a black ceramic clasp on a black coated nylon fabric strap. Well-made and with great detail, this watch is definitely worth the money and it is probably one of the best looking watches out there. The sub-dials at 3 and 9 o’clock are matt black and the black ceramic bezel has a black lacquered tachymeter scale as well. The 42 mm stainless steel timepiece is presented on a black coated nylon fabric strap with white stitching and a foldover clasp. 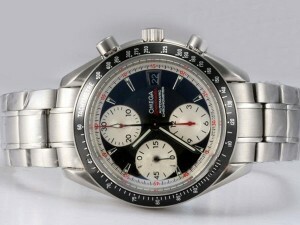 The Speedmaster Apollo 13 Silver Snoopy Award will be produced in an edition limited to 1,970 pieces. At its heart is the OMEGA calibre 1861, the same replica omega manual-winding chronograph movement that powered the legendary Moonwatch.